Last month we announced Education on Air — our free online conference taking place May 8-9, 2015 — and asked what you wanted to hear about. Today we released the schedule of sessions, based largely on what we heard from you. We’ll emphasize innovation — 44% of you voted for this — as well as how to empower students and use Google tools effectively. It was clear from our second poll that you also want practical examples, so our speakers will go beyond theory and share their specific advice for enacting change. Tune in from 10 a.m. to 3 p.m. ET to hear from educators, business and policy leaders, students and researchers, whose keynotes will challenge you to innovate and improve education. In our kickoff session, panelists will tackle the question “What are the skills of the future?” and will touch upon results from an Economist Intelligence Unit survey. You’ll also hear panels of different perspectives about some hot topics for educators, including how technology is transforming learning and how students are guiding their own learning. 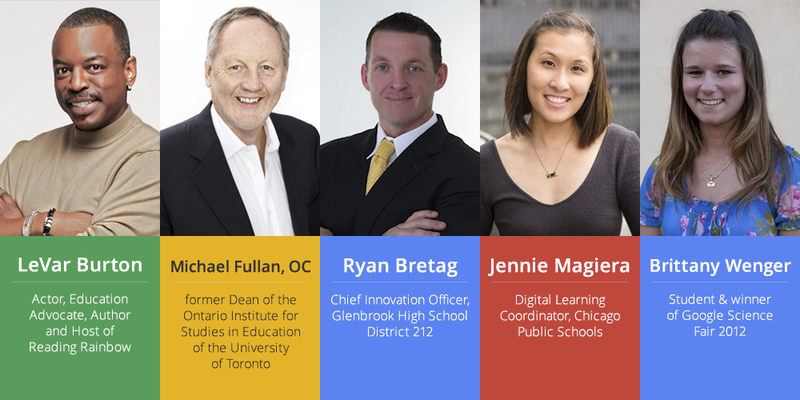 In addition to these panels, our keynote speakers will share their personal passions for the future of education. You’ll hear from Actor, Education Advocate, and Host of Reading Rainbow LeVar Burton, Google Senior Vice President of People Operations Laszlo Bock, education leader and Order of Canada honoree Michael Fullan, and Sir Michael Barber, chief education advisor to Pearson and former Chief Adviser to the Secretary of State for Education during the first term of British Prime Minister Tony Blair. Educators and school leaders like Ryan Bretag, education researcher and Chief Innovation Officer of Illinois’ District 225, and students like Brittany Wenger (2012 Google Science Fair winner) will also share their perspectives. Over 100 sessions will be led by educators from 12 countries and 29 U.S. states, all specifically designed to offer practical advice and examples. Whether you’re interested in the track for educators, administrators, IT or “anyone,” we invite you to join for the sessions that are most interesting to you. Presenters will discuss tools and techniques that you can implement easily, affordably and immediately. Many sessions highlight how Google tools like Google Apps, Earth, Chromebooks and Android tablets can support learning and help educators save time. Others will relate to themes including collaboration and community, computer science and STEM, creation and creativity, digital citizenship, literacy and professional development. Visit the Education on Air site to see the full line-up of sessions and make sure to register; because even if you can’t join us live, if you register we’ll notify you when the recordings are available to view. We hope to “see” you there!